Imagine you work at Bohemia Interactive, on the DayZ team. Your working hours are filled with the groans of the dead. Your players kill each other, and those victims are lucky; the unlucky ones are turned into walking blood banks. When it comes to the weekend, what sort of personal project do you build? Certainly not a stressful shooter. For Viktor Kostik, who animates DayZ’s zombies in the daytime, the game he envisioned in his free time was serene and absorbing – a full-body VR experience that plonked players’ feet in the ocean, bathed their heads in tropical air, and wrapped their hands around a simple maze. The gentle challenges of Amazeing Adventures resemble the analog maze games you might associate with childhood, or even with woodwork class. But rather than ball bearings and bits of wood, Viktor and his team of peers from other studios have used Unreal Engine 4 and the HTC Vive as their raw materials. 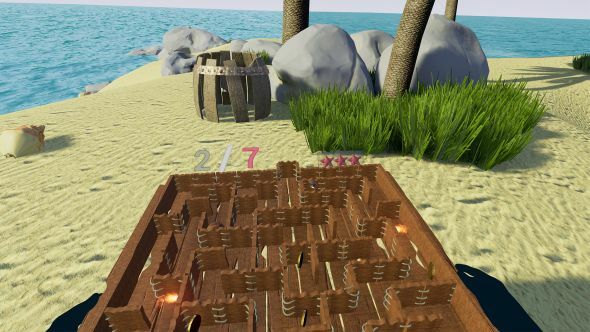 As in the traditional game, you tip the maze in your hands back and forth, sometimes altering the angle for speed, harnessing gravity in a satisfyingly low-key way. Then you peer a little closer, and – is something else moving in there? Yes: despite its roots in the real world, Amazeing Adventures takes full advantage of its digital environment. Tiny, sentient creatures move throughout the mazes, like invaders in a snow globe. What’s more, collectibles are dotted around the pathways, tempting you down different routes. And in later levels, spike traps impede your progress while power-ups offer protection from pyrotechnics. Some mazes are networks of triggers and doorways – open one door, and another will close, changing the structure of the map and the routes presented to you. It’s clear that these contraptions are more mechanically complex than anything physical maze games could offer. Of course, the Vive’s headset doesn’t just simulate the area around your hands – it’s a fully 3D world replacement tool, and Amazeing Adventures’ gentle escapism is reinforced by colourful VR backgrounds. That’s where the ‘adventure’ lies: in hopping from a tropical island, out into the open sea, onto the deck of a pirate ship and beyond. The mazes change in kind, reflecting their new surroundings and occasionally even influencing what happens in them. 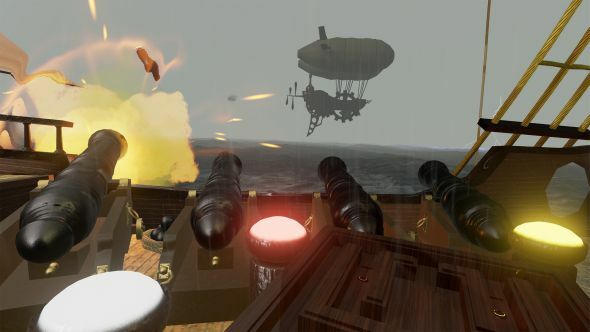 That involves rolling your marble agent over triggers that reload, charge weapons and finally fire, triggering a salvo that smashes into the enemy ships around you. “It’s like, ‘Oh wait, I was looking down all the time and now there’s stuff around me that I have to do.’ So there’s another level of gameplay there,” notes Kostik. It’s a little beyond what was possible in woodwork class. And all built since the summer by a tiny team in their spare time. Without even one dedicated programmer. 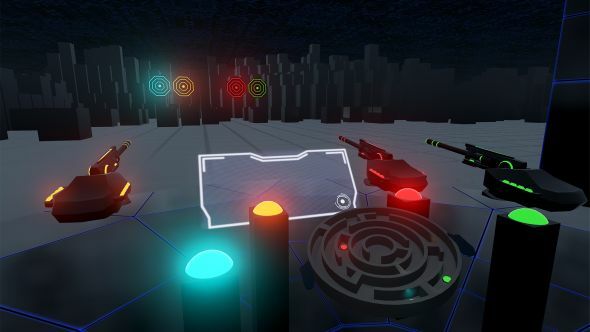 Using Unreal 4’s Blueprint scripting system, the team have put together around 20 levels, and hope to build the game out further in Steam Early Access. Perhaps there it can sit alongside DayZ – as the contrasting counterpart to a genre-defining shooter, emblematic of what could yet be done in the realm of relaxing PC games. Amazeing Adventures is coming to Steam Early Access with 15 levels, with plans for regular updates to bring it up to 70. Unreal Engine 4 is now free. In this sponsored series, we’re looking at how game developers are taking advantage of Unreal Engine 4 to create a new generation of PC games. With thanks to Epic Games and Ascendant Studio.